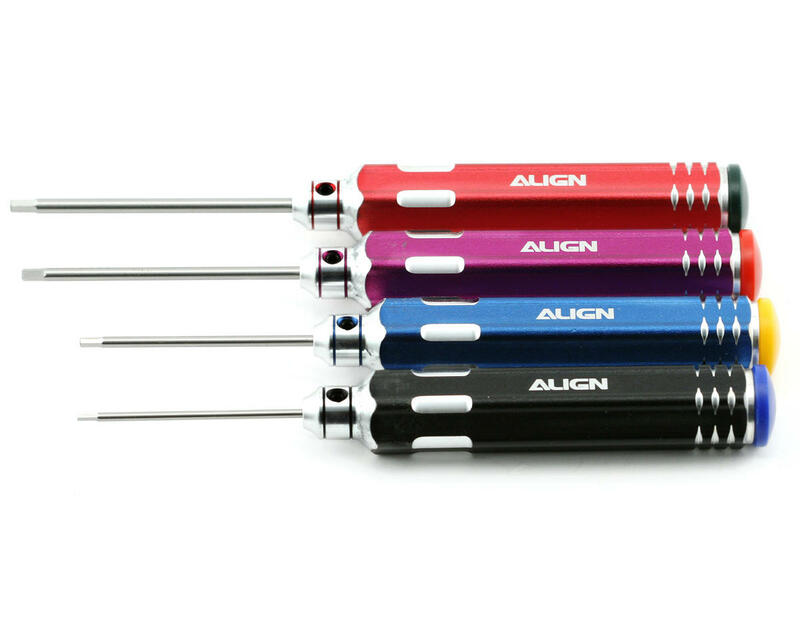 This is a set of four Align hex head screwdrivers featuring super hard, distortion resistant high alloy steel tips. 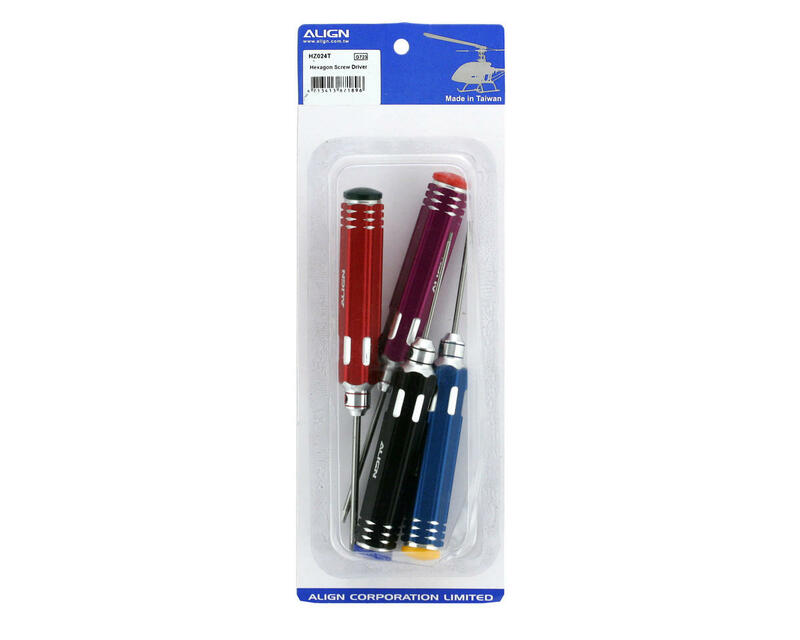 The CNC processed aluminum alloy handles are color coded to make it easy to identify the different sizes and are hollow for convenient storage of small components and screws. Tips are replaceable. My go-to driver set! They are so great for the price, been using 'em fer 2 years and they still are perfecto! If you plan to do a kit build and repairs i would suggest getting the MIP/HUDY drivers. Save yourself some money. After only doing repairs the main 2mm drive has rounded and is damaging screws, all the others are fine. Had these hex drivers for a few months now & found them to be reasonably good for the money, although they can be a bit slippery when trying to tighten a screw tight enough. They have been good until recently when the grub screw on a couple came loose, I used some blue threadlock & they have been ok apart from the blue 2mm hex, while trying to tighten a screw the grub screw some how stripped the thread in the alloy handle making it impossible to get the grub screw tight enough to hold the hex shaft. Think I'll try some with a knurled for better grip. Love these drivers great bang for your buck. little hard to hold on to when you have really dry hands but they really hold up!! I've had these for almost a year and they are awesome. The spinning end on the grip is a hand saver. Left them outside on accident and they are a little rusted but still in perfect shape. i'll be ordering another set. I did not have good luck with these the hex wrench would fall out of the handle then the set screw would get stripped out. Dont buy these!!! I did not have good luck with these. They look nice but while using one, the shaft twisted in the handle, then I tried to use the other to loosen the set screw on the "twisted" one, and the head shattered. Don't waste your money on these. I've had them for about 6 months haven't used them much because I run losi products & they don't use metric sizes until now. While I was building my 22 the tip started to twist & strip,starting to strip the screws. So,when building a new car it must not be strong enough to withstand screwing into new material alot. @brett red, thats what she said, btw these are awesome!! I've had these for about a year now and they are rock-solid with no breakage or signs of wear. These match the best in quality at a better price. JUST AWESOME YOU CANT BEAT THE VALUE OF THESE, COLOR CODED, GREAT FEEL AND ALL FOR 20 BUCKS. I really like these wrenches. Looks like they were made in the same factory as the pricey ones. Maybe a little less quality of finish on the paint, but the tool steel is solid and they show no signs of wear after using them to put together my SC-R.
Great Product for the price....Work just like the high-end ones with same feel....Good fit inside head of screw.... Different Colors make easy to grab the right size tool. Great set of drivers quality is outstanding and love the different colour! Best hex drivers thus far! I had a set of Integy wrenches before these and they sucked. I decided to switch to these because they seemed really cheap. Cheap didn't describe the quality though, which is good. These have lasted me for about a year so far and I am well pleased with them. Built a T-Rex 600CF, a couple Savages and a CRT.5, never mind the amount of times I have taken each one of those kits apart and they are still going strong with NO signs of wear. Highly recommended! I built my Venom creeper kit with these and they show no signs or wear... I love them! they sit im my hand comfortably with the aluminum handles and have changeable tips! Cant beat these for $20!!! Disappointed with these. I wanted to get them to match my other align drivers that have lasted a few years and are still going strong. Unfortunately these are different from all of the other align tools. The handles are different surface finish and are cnc'd differently. The tips are replaceable, but now they're specific to the handles instead of the old type where you could change tips as well as swap between different handle colors. I can't speak about the durability of the tips but I doubt they will last like my old Align tools have. It looks like they found a vendor that could do it cheaper and therefore increase margins. Looks like I'll be buying a Hudy set soon.